Grasscycling is the natural recycling of grass by leaving clippings on the lawn when mowing. Grass clippings decompose quickly, returning valuable nutrients back into the soil. Grass clippings are a major part of New Jersey’s municipal solid waste stream. As a Ewing resident, you are already helping to avoid air pollution and wasted resources by recycling. You can do more by reducing waste at the source. It’s easy. Let nature do the recycling when you leave the grass clippings on your lawn. You’ll avoid purchasing yard waste bags. You fertilize your lawn for free as you cut it! You’ll feed your lawn the natural way! Follow the “1/3 rule”—mow often enough so that no more than 1/3 the length of the grass blade is cut in any one mowing. Most Ewing lawns should be mowed 2.5-3.5” high, especially in the summer, to shade the soil, cool the roots, and block weed growth. Mulching mowers help by cutting the clippings into fine pieces that slip easily down to the soil. Most new mowers are mulching mowers, and you can attach mulching equipment to your existing mower. If you miss a week, or heavy rain causes fast growth, you have some choices. Double Mow Set the mower higher than usual and cut no more than the top third of the grass. In a day or two, set the mower height down and bring the lawn down another 1/3 of its height. Continue this process until you reach the desired height. Mulch heavy clippings into the garden Bag or rake the clippings and apply them to your garden as mulch. Spread them an inch deep, to cool the soil, retain water, prevent erosion and compactions, and smother weed seeds. Mix them with the soil New Jersey soils can be improved by adding organic matter. Added organic materials make heavy clay soils become more productive, and sandy soils retain more water. Compost Grass speeds up your composting, but can cause odors and deplete oxygen if not properly managed. If you compost large amounts of grass, turn the pile often with a pitchfork. Controlling watering rates will help your lawn grow at manageable levels and stay healthy. Don’t water until the lawn is dry. If it turns blue-green or gray, or if footprints don’t spring back, it’s time to water. Water in the early morning to prevent evaporation and conserve water. Provide about an inch at a time for clay soil, and half an inch for sandy soil. Place a few cans around the lawn and note how long it takes for that much water to collect. Water deeply and infrequently to produce a deeper, more extensive root system. Lawns watered too frequently develop shallow root systems that make them more susceptible to stress and disease. Will grasscycling make my lawn look bad? No! Follow the 1/3 rule-mow often enough so that no more than 1/3 of the length of the grass is cut. The short clippings decompose quickly and will not cover the grass surface. Does grasscycling cause thatch buildup? No! Grasscycling does not contribute to thatch problems. Research has shown that grass roots and stems are the primary cause of thatch, not grass clippings. Does grasscycling spread lawn disease? No! Improper watering and fertilizing are the primary causes of turf grass disease. If a favorable environment for disease is present, it will occur, whether grass clippings are left on the lawn or not. Does grasscycling require special equipment? A special mower is not needed to grasscycle. Regular lawn mowers can be used by removing the collection bag and adding a blade adapter, which will cut up and pulverize grass even more finely. 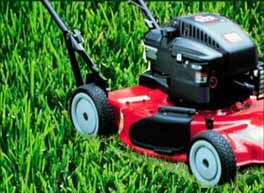 Also, check with your local mower dealer about mulching mowers that finely cut up grass clippings and return them to the lawn. Electric mulching mowers can also help reduce air pollution. To Enjoy A Healthier Lawn! Grass clippings add beneficial organic matter to the soil, which helps make lawns greener and healthier. Healthy lawns crowd out weeds. Grass clippings act as a natural fertilizer and reduce fertilizer requirements by 15-20%. Green waste collection programs are costly. Grasscycling helps keep garbage collection rates and your taxes down. Grasscycling saves time and the hassle of bagging, raking, and disposing grass clippings. Reducing the need for chemical fertilizers that cause toxic runoff that enters storm drains and pollutes creeks and rivers. Feeding your yard the natural way.